Ticket sales can sometimes be a fickle mistress. You’ve done everything right for years, put on great events that your customers love. But for some reason, this year, the sales haven’t come like you expected them to. Before you sound the alarm or overhaul your strategy, take a look at your current processes and see if there are any small tweaks that you can make that will have a potential impact. After all, your event didn’t suddenly tank, it’s still the same event that your participants love. You just need to try and put your finger on what has caused the decline in ticket sales and jumpstart it back to life. If you’re stuck for ideas, check out these points before you go in full-blown panic mode. Let’s start with the obvious; have you changed your pricing recently? If you’ve had a sudden price increase, then this clearly could have affected your ticket sales. If so, what is the reason for your price increase? Have you added new elements to your race? Have your supplier costs increased? Whatever the reason for a price hike, it’s always good to check what is going on with your competition first. In the endurance events industry, there are new events popping up all the time and you need to be aware if they are trying to undercut you on sales. Whilst you shouldn’t immediately start slashing your prices, it would be wise to look at yours and their value proposition to see if there is any movement you can make to get people through the gates. If you can afford to take a cut on price in the short term to compete with newer events, just make sure you invest in getting those customers to return to your next event. If you aren’t collecting feedback from your attendees, you need to be. You also need to take what they say seriously. When everything is going well, it’s easy to neglect collecting feedback. And why not? If participants are pouring in, then you must be doing something right? Whilst this may be true, when things go south, it can be too little too late. Understanding what your customers like/dislike about your event can help to offset a negative impact on ticket sales by preempting their expectations for the next race. Send and collect feedback forms, take Twitter polls and talk to people at your events. Collect as much data as possible so that you can make informed decisions. We all know the famous statistic, it costs 6–7 times more to acquire a new customer than retaining an existing one. Whilst it is very true if you aren’t pulling in new participants, it’s bad in the long term. Are you using paid marketing methods? If so, when was the last time you have evaluated their success? Have you refreshed your Facebook or Google ads? As consumers, we quickly suffer from ad fatigue and seeing the same message over and over can actually have an adverse effect. This would be a great chance to play around with your targeting demographics, slightly refine whom you are targeting and do a little A/B testing. It certainly may not be the best time as ticket sales are dwindling, but this could be a great time to double down on your acquisition method that has the highest ROI and some new faces in. If you’re new to paid marketing, here’s a guide to the basics of Adwords and one on how to use Facebook ads for events that should be enough to get you started. In 2017 people have come to expect more from the brands they support. This is especially true in the endurance events market. It isn’t enough to simply have a great event, you need to create an ‘experience’ that extends to both pre and post event too. With the sheer amount of competition in the marketplace, you can’t afford to not be engaging with your customers when they aren’t at your race venue. Content marketing allows you to engage with your audience outside your event, provide them value and ultimately move them further along the buying cycle towards buying a ticket. Whilst the common misconception is that content marketing is mainly for B2B businesses, there are plenty of options for event organisers too. Content marketing isn’t just about writing a blog either. Having a sound content strategy can add another layer to your race experience and provide your customers with material that will keep them coming back for more. Should you be using content marketing for your race? Yes, you should, check out our article on content marketing for endurance racing to find out why. We touched slightly upon paid advertising methods such as Facebook and Adwords earlier, but are you making the most out of the free options available? Social media is the first obvious choice here. Besides making regular updates across your social channels, you’ll want to engage communities online where they congregate. Twitter is a great way to do this, as it’s an open source platform where anyone can see your posts. Aside from social media, are you engaging your previous participants via email? Getting an old customer to come back is much easier than bringing on a new one. Check out our article on how to supercharge your email campaigns for a few tips. 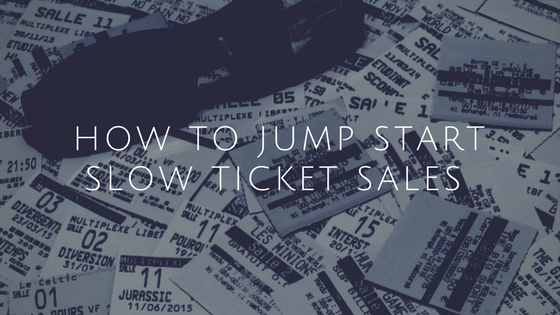 Are you getting the most out of your ticketing platform? One of the biggest opportunities that event managers are missing out on is the training period in the build up to their race. 50% of participants are training at least 3 times a week for your race, but what value as an event organiser are you getting from this period? EtchRock’s platform allows organisers to connect their participant’s training to your event, resulting in FREE peer-to-peer marketing for your race every time a user logs a training session in the build-up to race day. To find out more about EtchRock event management, check out our features pages or check out our case study on Marathon 401 to see how it worked for them. Like we said at the start, finding out why ticket sales are declining can be tough. If you are an established event, it’s most likely a case of having to make a few tweaks here and there. The answer certainly won’t be obvious but after a little digging and testing, you can be back on the right path in no time.